"Vehicle Conversion systems for the disabled"
Disabled, but want to be independent in your ability to travel, then approach Johan at EasyDrive WC Somerset West for a disabled accessible vehicle modified to suit you. Johan excels at. He will adapt your vehicle to ease your driving disability. Become mobile in your own right by having a vehicle adapted to suit your handicap. By using Guido Simplex and locally manufactured adaptation devices, Johan will make it possible for you to become mobile again. 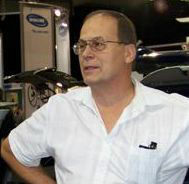 EasyDrive WC is owned by Johan Cillié, a Mechanical Engineer, who has been in the motor industry since 1986. Johan has been modifying vehicles for years now providing reliable, innovative vehicle solutions to the needs of the disabled. The combination of his mechanical and technical knowledge and his compassionate nature assures his clients of first class service. Nippi Drive. A cheaper way of getting around. Nippi Drive for wheelchair Scooter available ex UK. Did you know that as a physically challenged individual, you are entitled to a grant equal to the import duty on your vehicle from DTI? We are willing to assist you with this. Easydrive has just modified a power steering to be 50% lighter to operate. Lighter power steering is essential for high level injured drivers that lack the power to turn the steering wheel. Can an able bodied person drive an adapted Car? Certainly an adapted car by Easy Drive will have very little hindrance for able bodied driver. The brake and accelerator pedals will be reachable for his/her feet to operate as was the case before the adaption. Usually the most popular and basic hand control only takes one day to do. The more advanced systems that are imported takes a bit longer. Will any damage be done to my vehicle? Again, we are in business since 2006 and our customers are happy with the quality of work. Small pieces of the plastic covers must sometimes be cut away to facilitate the mounting of pivot point etc. We do the least amount of damage to enable the disabled. As we say there will be a compromise but we will try to suit your needs.